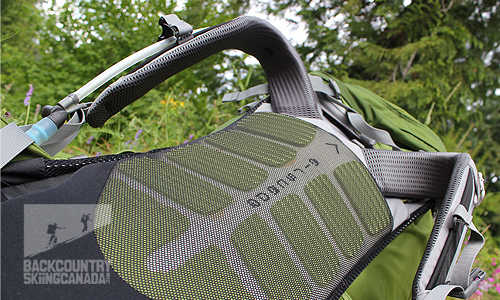 The Aether 85 Backpack has been my go-to pack for over two years now since it was first reviewed in the spring of 2011. That review can be found here and should be read first as it will explain all of the great features that this pack has to offer. 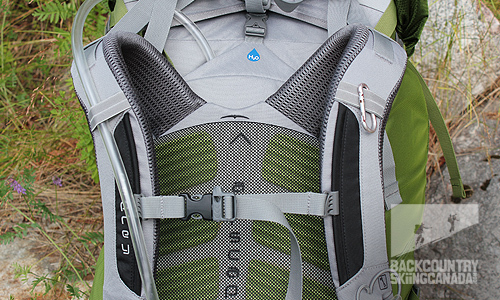 Two years is an eternity in the gear world and Osprey has since updated the Aether pack with a few new features to make a good thing even better. You have likely already heard of Osprey Packs (if you haven't been camping in the alpine too long) as they are a back pack manufacturer with a reputation for designing and producing solid full-featured packs with great fit and adjustability. 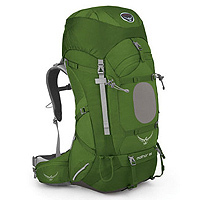 The Osprey Aether 85 is a men's specific pack so for the ladies out there Osprey has a similar offering but with a fit tailored to a women's physique and smaller stature. This version is called the Osprey Ariel pack and it too has been updated in the spring of 2013 with the same new features as the Aether Pack. The Ariel now comes in 55, 65 and 75 litre versions so you can choose your capacity to match your adventure. Look for this review soon. Both the men's Osprey Aether 85 and women's Ariel backpacks are traditional top loaders that come in a variety of carrying capacities, hip belt widths and torso lengths so be sure to get them properly fitted from a reputable local gear shop. 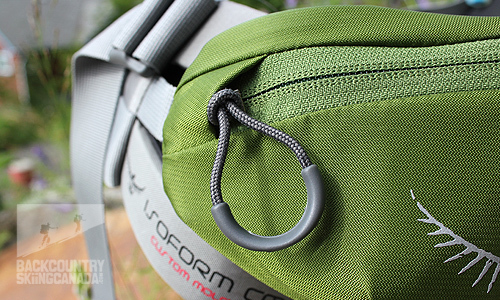 You will need to talk to a pack fitter at some point in order to get the updated IsoForm 4 CM hip belt heat moulded so that it better conforms to your hips and ensures an optimal fit. 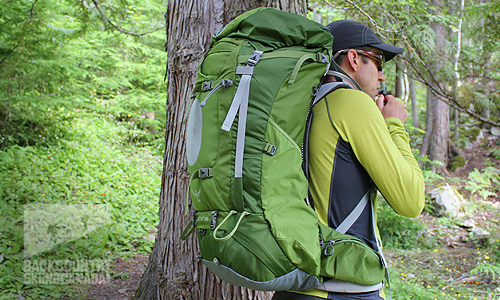 The Aether 85 is a large pack which is ideal for multi-day trips ranging from 5 to 10 days. 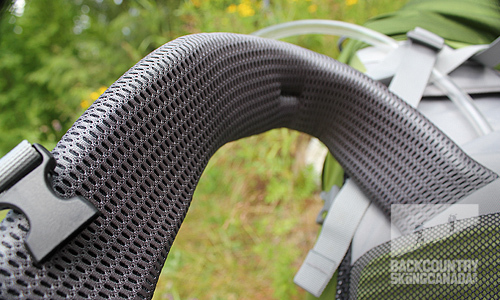 It's designed to comfortably carry 60lbs (or more) of gear. 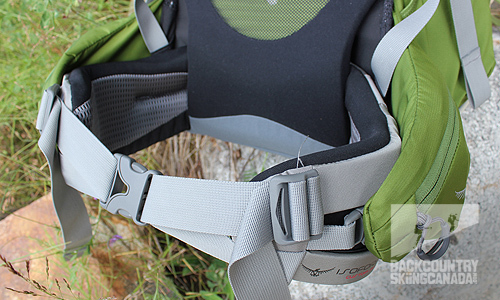 If day trips are more your thing you can reduce the volume by simply ratcheting down the compression straps. I often do this for summit bids and day tours while ski touring from a hut or lodge. 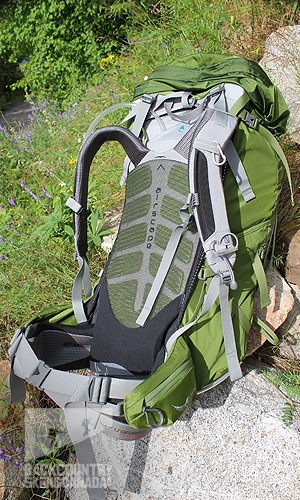 The primary reason that the Osprey Aether is able to carry such a load with ease is due to it's suspension system which is the pack’s foundation. 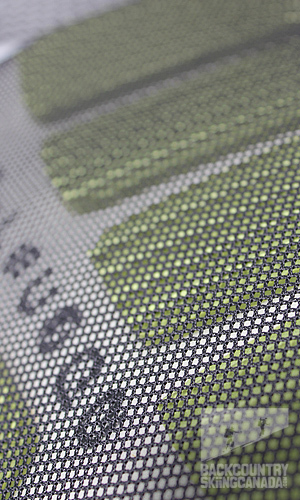 An aluminum alloy wire frame outlines the perimeter of the pack, and inside there's a single aluminum stay with an HDEP (a flexible but strong plastic) frame sheet that provides great rigidity and stability. On top of this is the new Osprey Airscape back panel which is designed for comfort and to dissipate heat where you typically generate the most sweat. A combo of mesh and air channels in the back panel allow a good portion of the heat to escape before it starts turning into perspiration. 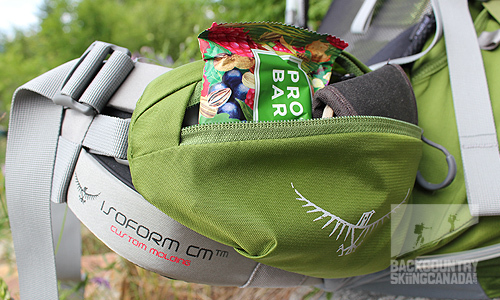 Keep in mind though that every pack will make your back sweat eventually. Cushioned shoulder straps which conform to your body for comfort in conjunction with the new IsoForm4 CM hip belt (which is designed to carry most of the load) distribute the weight effectively and cushion your body at any contact points. 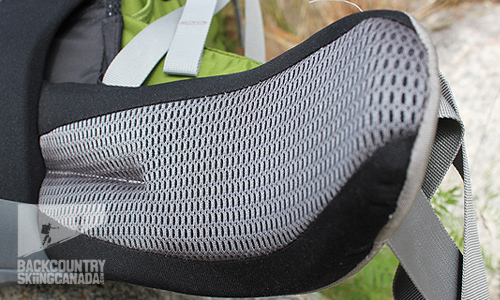 As mentioned above the IsoForm 4 CM hip belt has been improved with added stiffness and padding over previous models. Additionally there are now two zippered hip belt pockets which provide secure on-the-go storage for those need-to-have items. 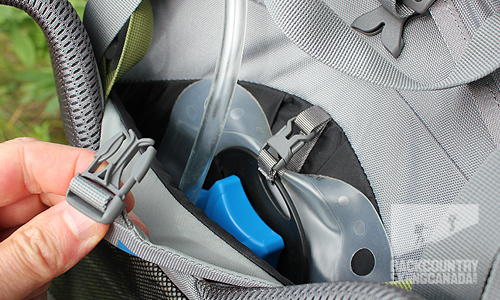 The new pockets are also large enough to carry a good sized point-and-shoot camera which cannot be said for most other hip belt pockets out there on the market today. There's also the new and improved Airscape back panel that was eluded to earlier. 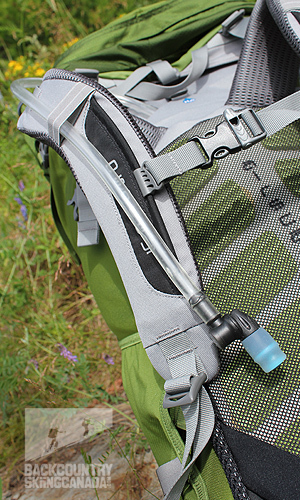 Integrated into this is an external hydration sleeve which simplifies refilling, protects your pack contents from inadvertent spills and frees up internal pack space. Miraculously all of these features don't add any weight to the Aether's bottom line; it still comes in at five pounds for the large version which I tested for this review. Improved IsoForm 4 CM hip belt. Two large hipbelt pockets, one on each side. As I mentioned in the intro all of these features are photographed and discussed in the original Aether 85 Pack review found over here so give a click on over and have a good look to better understand all of these features listed above. 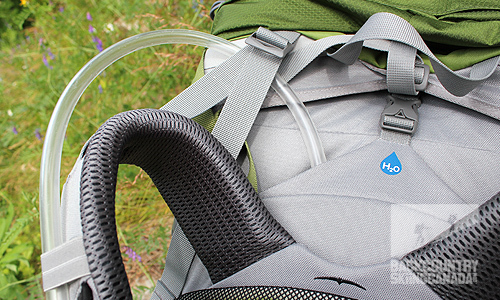 As you can imagine, based on my 2011 review of the Osprey Aether 85 Backpack things have only gotten better. Some of "cons" from my initial review were not addressed but some were so I am a happy(er) camper. There's also a noticeable improvement in comfort which I would have not thought possible two years ago based on the initial review. The added rigidity and padding on the hip belt has made things even more comfortable. The hip belt pockets are also a welcome feature that was sorely missing from previous versions. I particularly like these pockets given how large they are. I can easily fit my point and shoot camera and a few trail bars in each pocket. Not bad, not bad at all! While the Osprey Aether 85 Backpack isn't heavy at 5lbs it's also not considered lightweight either. 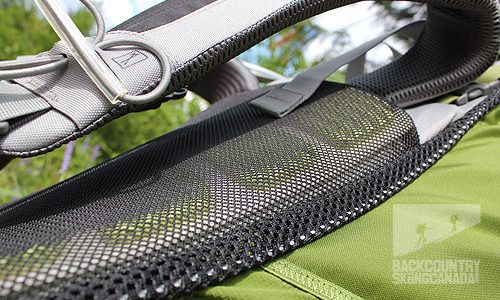 It is a full pound lighter than the Gregory Palisade 80 that we reviewed but in the opposite direction it's a full pound heavier than the Deuter ACT Lite 65 + 10. The Aether falls in nicely at the low end of pack weights however, and given the long list of features it's amazing it isn't much, much heavier. This is a well built, full feature, multi-day carrying machine. The Osprey Aether can literally do it all from summer hikes to winter ski tours—be sure to check it out! - New hip belt pockets are a welcome addition and large enough to actually carry things in!